Today, QuakeCon attendees were treated to a brand new Fallout 4 demo chock full of new information. While there’s no footage of this panel, we’ve rounded up the most interesting details for you. There will be about a dozen possible companions, including Dogmeat, Mr. Handy, Preston Garvey, and ‘Piper,’ a newly-revealed companion who you can meet in Diamond City. Mr. Handy can actually say your name—be it John, or something more ridiculous like “Mr. Fuckface.” He will vocalize it all the same. I can’t wait to see all the offensive and silly names that people come up with! In any case, Mr. Handy is voiced by Stephen Russel, who PC Gamer notes also voiced Garret in Thief. Finally, the inside of Mr. Handy is actually modeled, because I guess Bethesda wants to make sure you can see the details if he’s ever blown up. Piper, the new companion, wears a red leather coat and a newsboy hat. You can romance your companions, regardless of whether you play as a male or female. Not clear on whether or not this includes robots like Mr. Handy, but here’s hoping. Things that are back: bloody mess perk, Super Duper Mart, computer hacking, lockpicking, the Fat Man, and Behemoth mutants. The demo actually ends with the player shooting an atomic bomb at a Behemoth mutant. Book/comic book covers will be more detailed this time around, and you can zoom in and look at them. The leveling system works differently now. Perks are tied to SPECIAL stats, and not levels. Having specific high special stats means having good related perks. It sounds like factions can war with one another. IGN described a scene where the player watched ghouls attacking raiders, and noted that the player had the option to let it happen without interfering. Awesome. 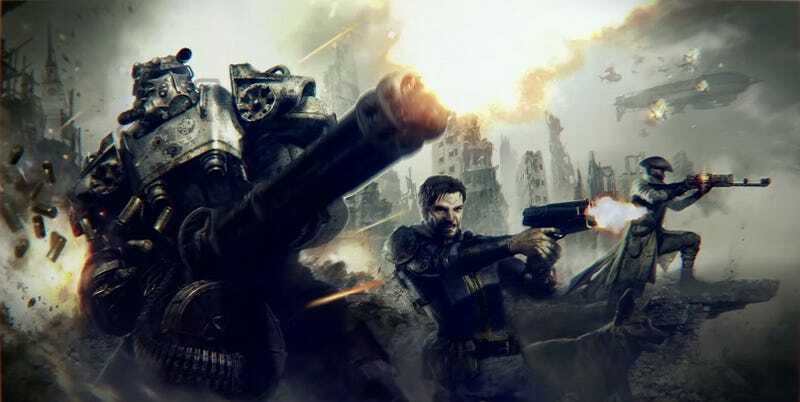 Additionally, they also noted that at one point the Brotherhood of Steel appears and joins the player in a battle against raiders.